Credit Ga. House of Reps. The chief justice of Georgia’s Supreme Court says it remains too difficult for low-income people to access the courts. 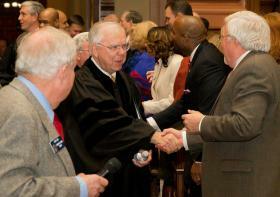 He delivered the message Wednesday before a joint session of the Legislature during the annual State of the Judiciary address. Thompson said courts are seeing more and more people representing themselves. “The reality is that poor people who represent themselves often lose,” said Thompson. He said the problem is especially prevalent outside metro Atlanta, where some counties are without a single attorney. Stephen Bright of the Southern Center for Human Rights says the availability of adequate legal representation remains an issue in both criminal and civil cases. For criminal cases, the Georgia Public Defender Standards Council is tasked with assisting those who can’t afford it. The council is funded by the state, but some county governments chip in as well. Bright says Georgia public defenders are often underpaid and juggling too many cases. “The state has miles to go until every person who has been accused of a crime gets an attorney who is able to devote the necessary amount of time for the case,” said Bright. On the civil side, the state provides no funding; nonprofits carry much of the load. The two main options are the Atlanta Legal Aid Society, which serves the metro area, and the Georgia Legal Services Program, which offers aid to the rest of the state. Bright says these nonprofits are “stretched extremely thin” and would need a “massive cash infusion” to address the state’s access issues. He suggested Georgia model Minnesota and other states that provide legal aid for civil cases.